Thorlabs is quickly catching up with the industry leader Newport. They offer a broad line of Linear Translation and Rotation Stages, as well as optical mounts, posts, rods, and optical components. 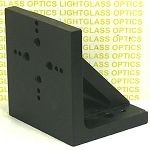 Lightglass Optics is constantly searching for more Thorlabs items to add to our stock.